Many of the barriers to the adoption of propane autogas are based on myths. Some propane marketers remember the inferior vehicle systems of the 1980s and are reluctant to enter the autogas market again. Many members of the public are not even aware that propane can fuel vehicles, so when they think of alternative fuels, they think electricity is the only solution. Four autogas experts will address these and other myths during a seminar at the National Propane Gas Association (NPGA) Expo in Atlanta. They will also present the facts about today’s autogas dispensing equipment, vehicles, and growth opportunities. The seminar is meant for propane marketers who are looking to learn more about the installation and maintenance of autogas stations; who are skeptics about the dependability of the vehicle systems and fueling infrastructure; and/or who want to sell gallons independently of the weather. The myth: “It’s too difficult to install and maintain autogas refueling equipment.” There is a general misconception that propane stations require substantial time and money to install due to the complexity of the systems, says Jim Bunsey of Superior Energy Systems. In addition, it is sometimes assumed that autogas dispensers require time-consuming training, are difficult to work on and maintain, and require extensive calibration. “These misconceptions sometimes occur due to the fact that other alternative fuel infrastructure, such as CNG and electric, do require substantial financial outlay, site preparations, and equipment,” Bunsey explains. 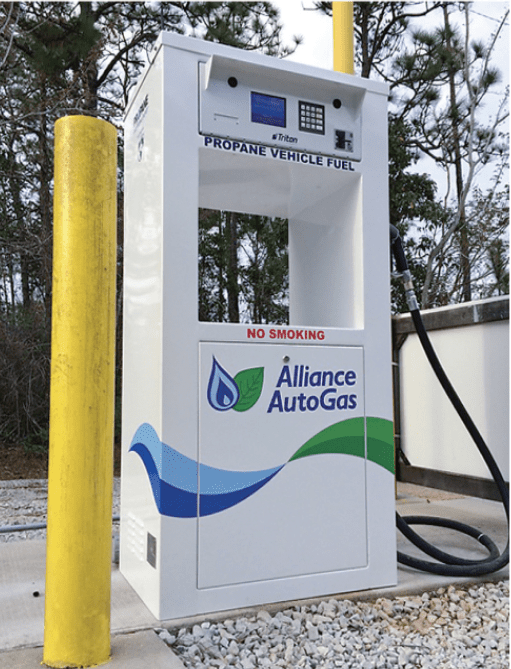 The myth: “Public refueling of propane autogas will never happen.” This myth exists because many people have never actually refueled or experienced refueling a propane autogas vehicle, especially with a modern dispenser equipped with a quick-connect nozzle, says David Kennedy of Alliance AutoGas. “They can only relate to cylinder refueling, which does necessitate a propane professional to refuel,” he explains. The myth: “Autogas isn’t worth my time, money, or resources.” Some marketers’ only experience with autogas is with the systems that went away in the late ’80s, early ’90s due to technology challenges. “They haven’t given the new technology an honest chance,” says Mark Denton of Blossman Gas. In addition, many people believe that you can’t make money on autogas because it is all “cheap” bid fuel only. To get the most out of the seminar they will be presenting at the NPGA Expo, the speakers recommend that attendees read up on autogas at the PERC website (propane.com) and bring any questions they might have. They also recommend that attendees consider how far autogas technologies have come since the ’80s—just as phone technology has evolved from payphones to smartphones—and come to the event with an open mind regarding marketing propane autogas. Their seminar, “Autogas Dispensing Equipment—Myth vs. Fact,” is to be held Sunday, April 14, from 9 a.m. to 10 a.m. at the NPGA Southeastern Convention & International Propane Expo in Atlanta. To see the original article, click here.